A man who tweeted an image purporting to be James Bulger's killer Jon Venables as an adult has been spared being locked up. James Baines, 27, from Liverpool, received a 14-month suspended sentence after admitting contempt of court at the High Court in London. 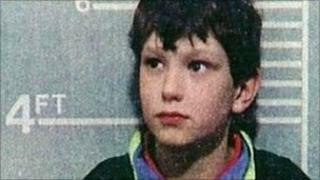 Venables and Robert Thompson were convicted of murdering the two-year-old in Merseyside, in February 1993. The image was tweeted on 14 February, the Attorney General's Office confirmed. In a statement, Attorney General Dominic Grieve said: "It gives me no pleasure to bring a third case for breaching this injunction and I do so purely in the wider public interest. "The order has been in place for many years and applies to both media organisations and individuals. "It is meant not only to protect Venables and Thompson but also those members of the public who have been incorrectly identified as being either of them." Baines was ordered to pay £3,000 in costs. His counsel, Peter Lownds, said the tweet was posted two days after the 20th anniversary of James Bulger's death and it was a "highly emotional" time for the community. He said: "[James Baines] had a very strong emotional reaction to the anniversary. He accepts it is not an excuse for his behaviour but it is offered as some explanation for why he became involved in the very substantial social communication at about that time. "He recognises and accepts that, whilst he is entitled to hold his strong views, he was completely wrong to do what he did on that day and was not entitled to take the law into his own hands." Two men who published photographs on Twitter and Facebook said to show both of James Bulger's killers also received suspended sentences in April. It was the first time the Attorney General had issued contempt proceedings over the use of social media, although people have been fined for breaking the law on Twitter or Facebook in several other high-profile cases.